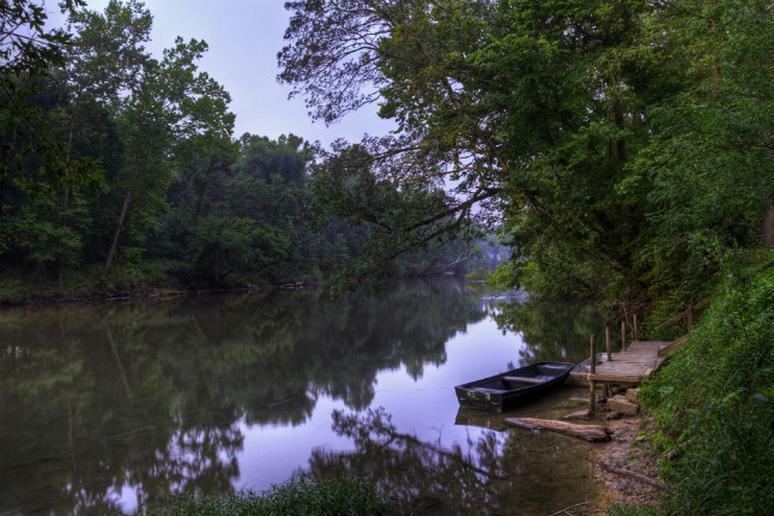 A pit stop on a float trip down Meramec River in Missouri proved fatal when a property owner shot a man in the face from close range. James Crocker of Steelville, Missouri, allegedly became incensed when he saw a man urinate on what he considered to be his property. Crocker, a property owner along the river, emerged with a handgun and confronted the group for trespassing. Paul Dart Jr., a fellow traveler with the man who was urinating, was shot in the head by Crocker during the altercation, the St. Louis Post-Dispatch reported. Dart, 48, of Robertsville, Missouri, died in an ambulance on the way to a hospital, less than five hours after setting out on a leisurely float along the river. He was an Army veteran and a union carpenter, he married his wife Loretta Dart about two years ago. "My husband tried to calm the guy down," Loretta said. "He went to the guy's arm to try to stop him, but the guy jerked back and popped him in the face." Crocker and the people in Dart’s group had argued for several minutes before the shooting. Crocker told police he fired warning shots as four men moved closer to him on the gravel bar, with one of them—not Dart—holding rocks. "I just shot the one closest to me," Crocker said, according to police. Dart was shot from about three feet away. Crocker is being held on a $650,000 cash-only bond. But who has rights to do what isn’t always clear on the river. Smelser, Crocker’s neighbor, said that he was not sure himself where his property line ended, but that he believed it extended to the middle of the river. Various people in state government gave varying answers for who can go where. Some referenced the vegetation line, but that can change. Others said it depends on whether a river is deemed “navigable,” which can also be difficult to pin down. The issue of private property laws along Missouri's streams and rivers is guided by a Missouri Supreme Court decision from 1954, called Elder v. Delcour, which talked about streams that are navigable or non-navigable. Rob Brandenburg, an agent who covers Crawford County for the Missouri Conservation Department, said property lines actually go to the center of the river. The public’s right to use this property is an easement much like a public road, Brandenburg said. A property owner owns a county road to the center of the road, for example, but a person can use that road. Another Conservation Department employee, a spokesman for the department, said it is a complicated aspect of Missouri law and that, typically, the question is answered on a case-by-case basis by county prosecutors. “This is an area of Missouri law still up in the air,” he added. A lawyer from Ozark, Mo., Harry Styron, has researched extensively the topic of property rights along streams and rivers.